Ask fellow campers about "Lakeshore Park Campground" and nearby attractions. This is a pleasant little RV park. We enjoyed being here. Most of the sites are open and sunny, although the back row is mostly shaded. The sites are well-spaced and roomy. There are lake views from the park and a partial view of the Mackinac Bridge from the park's little beach area across the road which is also a great place for sunset pictures. Management and owners are very friendly and helpful. We used this as a base for exploring St. Ignace and Mackinac Island. We'd definitely stay here again if in the area. We camped at Lakeshore Park Campground in a Fifth Wheel. Don't follow the GPS to this site. They have signs on US-2 to lead you to the park correctly. Sites are gravel/grass, fairly level. Comfortable space between site but not spacious. We had a pull through (220) that had plenty of length but our picnic table was almost on top of the adjacent site sewer connection. Good water pressure. Few trees so satellite reception was good. No cable. Wifi was strong and fairly fast. Some sites have a view across the road to Lake Michigan. They own a small beach that is an easy walk across the road. Staff was very friendly and helpful. We camped at Lakeshore Park Campground in a Fifth Wheel. The Shepler ferry will send a free shuttle to pick you up at the RV park so you don't have to drive to the harbor and pay for parking. Mackinaw island was fun to explore. Would skip the horse carriage ride. Guides did not impart much information that you would not get by reading the signs along the sidewalk. After a few tee shirt, fudge, and knickknack shops, they all start to look a like, and your tired of the main street. We stayed 3 nights. The park was easy to access. The wi-fi worked well, as did the hook-ups. The restrooms and laundry are older, but well-maintained. You can sit on the office porch in a rocker and see Lake Michigan while doing laundry. We camped at Lakeshore Park Campground in a Travel Trailer. Ferry from St. Ignace to Mackinaw Island and/or drive to Sault Ste. Marie and take locks boat tour. We stayed in the front row and pulled in to our site for best view from our class A. Fifth wheels back-in. The sites are close together but the view was nice. You can't really see the bridge from the campsites. Second and third row have a lot of trees, front row doesn't. East access in and out of the park. Wifi actually worked well for us as did our satellite dish. Small laundry room but it worked fine. Didn't use the restroom. Everyone was friendly. Plenty of grass for dog walking. Nice access across the road to Lake Michigan and worth taking a look at. We would stay again if in the area. We camped at Lakeshore Park Campground in a Motorhome. Mackinac Island is the highlight here. We took our bikes on the ferry and rode the 8.2 mile path around the island and really enjoyed it. Easy bike ride. Be sure to take the ferry that takes you under the bridge before going to the island. Easy and efficient check-in. Staff very friendly and helpful. Nicely spaced parking with all utilities working as expected. We checked several of the other parks in St. Ignace and are glad we chose Lakeshore. We camped at Lakeshore Park Campground in a Motorhome. We stayed here a week. Very nice park. They had the best wifi of any park we have stayed. No cable but we did not use the tv. Owners were very friendly and lived on site. Would stay there again. We camped at Lakeshore Park Campground in a Travel Trailer. Stayed three nights. Camp staff very helpful in pointing out things to see. Camp well kept. On the lake. We camped at Lakeshore Park Campground in a Travel Trailer. 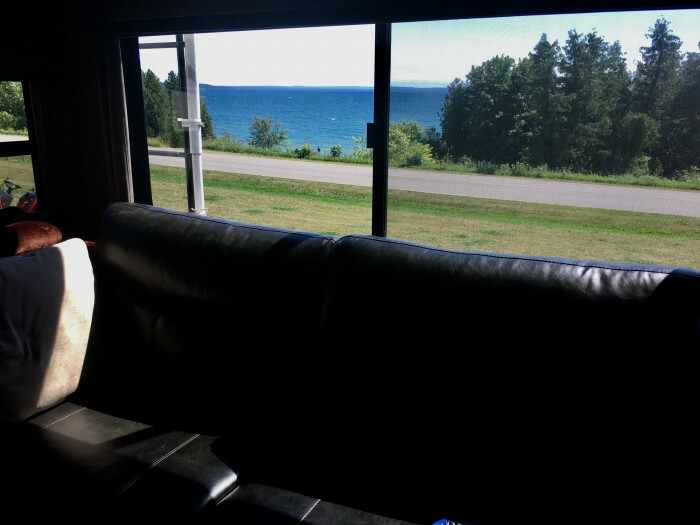 Easy location for day trips to Whitefish point and Macaniac Island. The WiFi was good as well as Verizon. Site was level. The site really was not long enough to stay connected. Their bathrooms were the cleanest bathrooms I have seen in an RV Park. It is confusing with motorcoaches pulling in facing Lake Michigan and fifth wheels and travel trailers backing in. If you back in you have to go under your rig to hook up to the correct electrical post. Have a long cord! We ended up facing another front door each new arrival. One turned on the outside TV all day even though in the rig, sat in our chairs and used our table, the other ones were extremely respectful of our small space and we became great friends with them since we faced each other! So hope you get some great neighbors if you have to face them! We loved our peaceful view of Lake Michigan and enjoyed watching the freighters go by and the fog roll in. The stars at night are gorgeous and you can even see the Milky Way. OTA TV had an excellent visit Michigan channel. We camped at Lakeshore Park Campground in a Travel Trailer. Be sure and drive up to Tahquamenon Falls and White Point. The ferry to Mackinac Island is fun and a shuttle will come get you at the RV park. The Zodiac store has the best pasties-try the chicken ones too! A seasonal no frills RV park with convenient access to St. Ignace and Mackinac Island. RV sites are pull-through with full hook-ups. Third row sites offer nice shade trees and front and middle row are full sun. $3.00 per day charge if you use your AC. Nice breeze coming from lake during our visit, so did not need AC. Shuttle to Island ferry comes to the RV park. Nice stay for a visit to the area. 24 hour laundry. Level sites and pretty close together but, if you are in the straits area for the sights, you will be spending little time at your site. We camped at Lakeshore Park Campground in a Fifth Wheel. Beautiful views of Lake Michigan. Very quiet park. Geared towards adults or families looking to be close to Mackinac. The staff is friendly and helpful. The roads are gravel and the sites are grass and pretty level. We stayed in a pull thru site that was plenty long. The WiFi worked well for us and I noticed it had plenty of repeaters every few sites. We have been here twice and will use this campground again in the future. 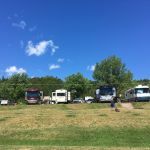 We camped at Lakeshore Park Campground in a Motorhome. Very convenient to Saint Ignace and Mackinac Island. Sites were gravel and grass. Easy to maneuver in and out with our 44 foot Motorhome. Picture window of Lake and Mackinac Bridge even though we were not in front row. Shopping and grocery store less than 15 minutes away. We would return here again. We camped at Lakeshore Park Campground in a Motorhome. This campground served as an excellent base camp to explore the surrounding area. The sites were fairly level, the views were breath taking and the wifi was strong. We camped at Lakeshore Park Campground in a Motorhome. 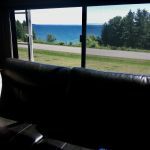 This is a nice, smaller campground with a great location close to St. Ignace and right across the road from Lake Michigan, with its own small, rocky beach. Sites in the front row are close together and have a great view of the lake. The other sites are long pull-through, gravel and grass, and all have full hookups. Wifi was often weak. Bathrooms, showers and laundry room were large and clean. Office staff was very friendly and helpful. A great place to stay. We camped at Lakeshore Park Campground in a Motorhome. This is a decent RV park with a lovely view of the Straits. Registration area is tight and not level. Staff was friendly and helpful. Roads are hard pack dirt and a bit tight. Sites are grass, mostly level and a bit tight. Picnic table, some sites had fire pits. The utilities worked fine. No cable. Didn't try OTA. The first two rows are satellite friendly, the third row is shady and hit or miss. The internet was excellent. The restrooms are old and uninviting, but clean. Big rigs are best suited to the back half of the second row, starting around 215. Cell service was good. We camped at Lakeshore Park Campground in a Motorhome. The bridge will cost you $4 each way for car, $5 per axle for RV. Across the road in front of the RV park is beach access. Great place to relax and enjoy the sunsets. This is a very nice campground right on the shore of Lake Michigan. We had a big pull-through spot with plenty of room for our car. It rained all day one day but sites drained well. Plenty to do in this area. We camped at Lakeshore Park Campground in a Motorhome. Great place to take day trips to other parts of the UP. Big rigs might have difficulty here. 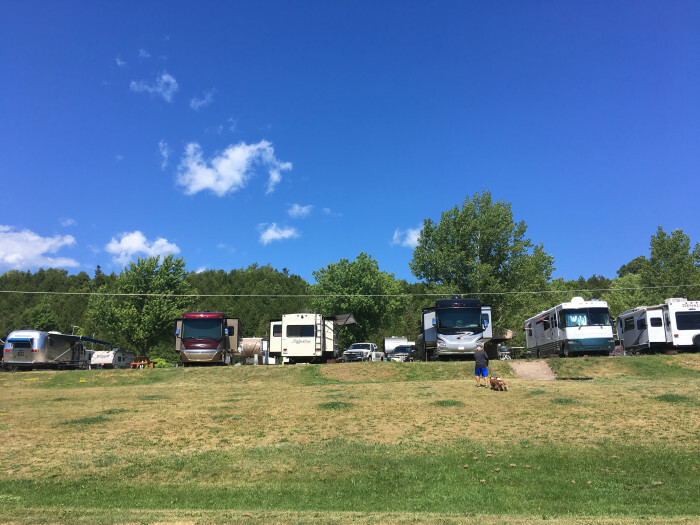 Mostly, this RV park was full of large fifth wheels and travel trainers; there were few large motorhomes. Spaces are fairly close together so trying to get a big rig in here could be difficult. If you get the front row, you get an ocean view but you also get much more wind and noise. However, if you park in the back you get a lot more lawn, it is quiet, but no lake view. Enjoy the Lake Michigan view on the beach. Will be taking the ferry to the island. It's an easy 5 minute drive to downtown and parking was not an issue when we visited. There is a small sitting area across the street down by the lake. The seats are not comfortable but the view is great. We also discovered a nice bike ride. If you turn left out of the park and take the next right (about ½ mile), the ride goes along the lake until you get up near the Mackinac bridge. St. Ignace is a great place to shop and see the beautiful scenery around the lake. Mackinac bridge and island are available via ferry and a shuttle will pick you up at the park and bring you back for no charge. Go downtown to see the sites. Mackinaw Island, Mackinaw Bridge, many shops and places to eat. St Ignace, Mackinac Island, Mackinaw City and the Eastern Upper Peninsula are all within an hour. Very close to ferries to Mackinac Island. Local food was very good and close by. Great place to stay if you want to go to Mackinac Island, it is within 15 minutes to catch the ferry. It is about 10-15 minutes to the Mackinac Island ferries in St. Ignace. Parking is available at the docks, or they will pick you up at the RV park if you call. Are you affiliated with Lakeshore Park Campground ?